According to the "Aqours First LoveLive! ~Step! ZERO to ONE~" concert in Yokohama, Love Live! Sunshine!! anime will get a second season this fall. This is the first time of the nine-girl Aqours group to hold a major concert, and they also mentioned that the "Love Live! Sunshine!! Aquors 2nd Love Live! Happy Party Train Tour" will be held in the second half of the year. The concerts will get live-screenings in the following countries and areas: South Korea, Taiwan, Hong Kong, Singapore, Thailand, Australia, Malaysia, and the Philippines. The Love Live! Sunshine!! project was revealed in February 2015. The project's three key words are "Reader Participation," "Inspired by μ's," and "Seaside Town Setting." The group's Aqours was named by fans' popular vote. The Love Live! 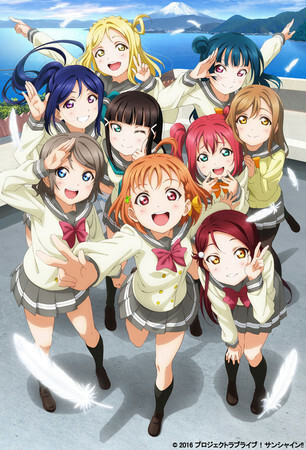 The School Idol Movie anime film was released in June 2015. The first Love Live! Sunshine!! anime aired in 2016.